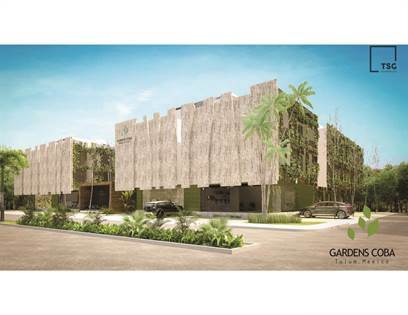 GARDENS COBA is one of the very few projects in TULUM offering mid price units | Location is very close to shopping centers, downtown Tulum, a bike ride of 10 min from the beach or the famous Tulum Ruins | The layout consists of cozy studios and 1 & 2 bedroom apartments | Pricing starts at $ 92,000 for a 370 sqf studio | $ 147,000 for a 800 sqf 1 bedroom apartment | $ 173,000 for a 800 sqf 2 bedroom apartment | Units are delivered with equipped and furnished kitchen, closets and mini split inverter AC | AMENITIES | Lobby & reception area | Solarium with hammocks | Gym | Elevator | Pool | Pool bar | Wellness center | Sauna | Laundry | Delivery tower 1 September 2019 | Delivery tower 2 February 2020 | Please note the developer is pricing in Mexican pesos, the final price is subject to change due to the exchange rate. Hi, I'd like to find out more information about Affordable condos in Tulum. Thanks so much!